The TDP's commitment to the end of Kurnool district has been successful. Leaders and activists were participating in the district in support of CM Chandrababu's hunger strike. KE Krishnamurthy, MLA, SV Mohan Reddy, MPs Butta Renuka and TG Venkatesh participated in the Kurnool rally. Bhooma Akhil Priya and MLA Bhuma Brahmananda Reddy initiated the initiative in the Nandyala Division. 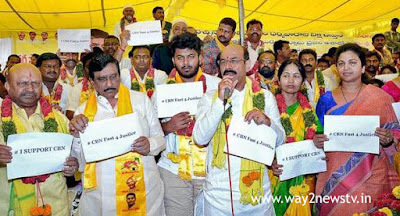 TDP MLAs and Incharges continued in the constituency in the constituencies. MLA BV Jayanageswara Reddy, MLA Budda Rajashekar Reddy in Athmakur, MLA Mani Gandhi in Kodumuru are committed to Strike. In Allagadda, there were two initiative camps in support of CM. One camp under MLA Bhuma Akhila Priya, And another camp under AV Subba Reddy.